Celebrating the 50th anniversary of the formation of the original Wishbone Ash featuring a full performance of the iconic 1971 album "Pilgrimage" + other Wishbone Ash classics. Wishbone Ash was formed by West Country musicians Martin Turner and Steve Upton. Martin Turner envisaged the band’s innovative harmony-guitar hallmark and guitarists Ted Turner and Andy Powell were recruited via a now legendary Melody Maker advert. The partnership of the original line-up of Wishbone Ash forged a unique musical identity that would produce some of rock music's best loved works and influence numerous successful bands and result in millions of album sales and concert attendances. Wishbone Ash would become one of the most enduring and best loved British rock acts and its name synonymous with high quality guitar-driven melodic rock music. Over four decades later, the enduring music of the classic marks of Wishbone Ash continues to delight audiences worldwide through both live performances and a rich legacy of recorded work that continues to be enjoyed by fans old and new. 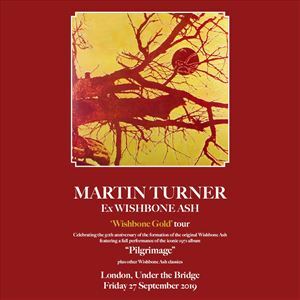 Classic album releases such as Argus, Pilgrimage, There’s the Rub, New England and Live Dates defined the Wishbone Ash sound and have touched the hearts of several generations of music fans. As lead vocalist and key creative force, founding original member Martin Turner was central to the critical and commercial success of Wishbone Ash’s most revered albums, with his passionate vocal delivery, songwriting ability, keen melodic sense and production values being key ingredients in the definitive Wishbone Ash sound.